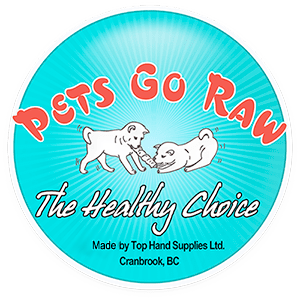 Pets Go Raw is manufactured in Cranbrook, B.C. by Top Hand Supplies Ltd. The Lauries started the business by making food for their Shiba Inu dogs. When one of our show dog’s began a raw food diet, we were so impressed by his coat and condition that we decided to change his diet to frozen, raw food and there is where it started. We began researching and experimenting with raw food in our home. We wanted a product we could feed to both our mature dogs and the young puppies on weaning. When we settled on a recipe, we bought a small grinder and started bagging by hand. As friends and acquaintances saw our dogs, they wanted to change their diet as well, so we started producing in our kitchen during evenings and weekends. We quickly needed to expand. We incorporated the company and sold shares to raise working capital. We moved operations to a building in Cranbrook in January 2004. We began by grinding the product in a large grinder and then used a mixer-grinder to mix the product. We packaged in bread loaf tins putting the product in by hand and freezing. Next, the pans were emptied and the frozen loaves were put into bags. This was extremely labour intensive and not very satisfactory. We later obtained a water-hydraulic sausage stuffer that we loaded by hand. We stuffed large diameter sausages, froze them and cut them to approximate weight. This worked reasonably well, but it was hard to produce sausages that were even in diameter, and the saw had to constantly be adjusted to cut patties to size. At this point, we purchased a bowl-cutter, which is similar to a huge mixer with very sharp cutting blades. This machine replaced the mixer-grinder and made for a more uniform product. We also started using a sausage stuffer that was semi-automatic. While it worked better, the sausages were still inconsistent, hand tied and required cutting with a saw. In 2012 we bought more viable machinery, including a good grinder, a bowl-cutter, an automatic sausage stuffer and a semi-automatic clipper that staples the sausages. In 2016 we replaced the one-stage grinder with an automatic three-stage grinder. To handle the increased production from the new grinder, we retired our small bowl-cutter and replaced it with one that handles double the product. Our packaging also has evolved. Our products are cut to size (1/2 pound and 1/4 pound) and either shrink wrapped with double wrapping or offered in bulk boxes with a box liner. As well we offer a 5 pound sausage for people who want this option. Stu sold the company to Sherin in November of 2014 and has since retired. Sherin and her fantastic crew continue to produce a great product to help promote pet health. We are moving forward to give you the very best pet food possible. We are committed to producing a top-quality product for a reasonable price. When you are in Cranbrook, B.C., visit us, tour our plant and see how our product is made. We are very proud of our staff and facilities and love to show them off. Keep your pets healthy and happy with great food. Again, I just wanted to say you guys have an awesome product. My dog goes nuts whenever its meal time! Thank you, thank you, thank you! It’s been a couple of weeks since our 5th birthday Pawty and we finally have all the numbers tallied. With your help we were able to raise over $4,000!!! S.A.I.N.T.S, West Coast Dog Rescue and PV SPCA were the beneficiaries of these donations and also want to say thank you. Without your donations or help we would not have been able to do this. Please accept our deepest gratitude. Together we do make a difference! Sincerely, The Bone and Biscuit Cloverdale Team, Andrea, Jen, Tracy, Karen, Emily, Jolene and of course Bauer and Hector. I wanted to submit a testimonial for this amazing product, as I can’t believe how our dogs are doing. We have a Jack Russell and a West Highland Terrier (2 white dogs), and they are prone to having skins problems. Our Jack Russell is 12 years old, and I have tried a multitude of different dog food products, but she was always itchy, scratching, and biting, and licking herself, and in the end she was losing her fur. It was so bad, she could barely sit still. We started feeding Pets go Raw in November 2016, and we saw almost instant results, her fur started growing back, and it is silky soft (she always had coarse fur), her skin turned pink, instead of red, and she is able to have restful sleep, instead of jumping around all day/night long. Our Westie was itchy, licked his paws incessantly, and bit at himself (backside, paws) constantly. He also smelled yeasty (Frito feet), and we had to put a cone on his head to keep him from damaging his skin or we had to take him to the Vet for antibiotics and anti-itching shots. We started feeding our Westie Pets Go Raw at the same time as our Jack Russell, and almost immediately his fur started growing back (he was losing hair on his backside), and he is so soft and silky. His skin also turned pink instead of red, and he barely scratches himself now. We no longer have to put a cone on to keep him from scratching/biting himself. Our dogs are happy and healthy now. They also drink less water, and the number of poops has gone down significantly. Thank-You Pets Go Raw for giving us our dogs back! I would love to share my experience with having switch over my 6 month old French Bulldog. Ever since he was 2 months it was a struggle to figure out why he was throwing up and using the bathroom up to 8 times daily. I figured it was the kibble diet, I had him on three different kinds of food that our Vet suggested, However, it was only making him gassy and anxious to always use the potty. I than went to The Bone and Biscuit, and asked for a solution… They educated me on the raw food diet! Which was a blessing, and has helped out my little guy!! he has gone from 8 x daily to 2 x daily with the potty. I have also noticed that he is much happier and his coat shines!!! Thank you for making this product, and thanks for making it affordable. My little guys are thriving on your food, and I have seen massive changes in my 14-year old who has been treated for the last 5 years for severe liver problems, and then developed a massive systemic yeast problem that has damaged substantial areas of skin…. a constant battle and a very odorous dog. Today… after 6 months on your food, his blood work is wonderful with no signs of liver problems, he has lost weight and gained energy, his yeast infection seems almost under control and his skin is clearing and he no longer smells of yeast and bacterial infections. His quality of life has improved beyond description. Hey, I just wanted to send an email out about how much our dogs LOVE Pets Go Raw. We have 2 Brittany Spaniels and it has done wonders for them. There Coats are Beautiful. They are Maintaining a better weight and are so excited to get fed every day. Oh and our back yard has way less dog poop!! I just want to thank you for such a wonderful product!!! We’ve fed raw to our kennel dogs the last few years, but we just started feeding exclusively raw to a couple litters of our pups this past month, starting from 3.5 weeks onward. Hi. I want to thank you for your wonderful product. We have 6 dogs and 4 cats all on your product that we purchase at Growlies in Langford on Vancouver Island. Our animals are extremely happy and healthy and we find it easy to feed. We refer you to everyone. Keep up the great work. We just wanted to write and thank you for all your help, our furry baby Lola is loving it (her food). We are thoroughly impressed with your customer service and care you took to remedy our situation. I just wanted to send an e-mail to thank you for your fantastic affordable Raw food! I have two large dogs(85lbs and 70lbs) and I feed them raw exclusively. Your products make it affordable for me and the quality is fantastic. I recently got a new kitten and I will try to get her on to raw too. I have 2 boxers with very high metabolisms and I’m using 4lbs of your food/day, we started on it in August 2013 and I am thrilled with the difference in my dogs!! I’ve always fed them top quality kibble but from day 1 my male has had tummy issues, which is fairly common in boxers, I could never get consistent firm stool from him, it would stay firm for a couple of weeks and then back to cow patties; also it was torture trying to get him to eat so he was always underweight. I am so happy to see him excited to eat at every single meal, nice firm stool and so much less of it, also he no longer can clear a room with his gas!! They are both much happier dogs since I made the switch so THANK YOU!!! I just wanted to share this. I have a Yorkie, he will be 3 in December. He “was” the fussiest pup on the planet to feed, I mean FUSSY! Since he was just 10 weeks old I’ve had him on raw food, tried many and found one I could entice him to eat with crumbled cooked chicken breast mixed in. I literally jumped through hoops to get him to eat. When I went to the Bone and Biscuit to get another bag recently they were out, and of course knowing his fussy history thought it was going to be a rough 3 days to get him to eat. Darcy who managed the Bone and Biscuit here in Kamloops suggested I try Pets Go Raw Bison. I was skeptical, but WOW, I’ve never seen my little Casey enjoy his food like he does this. He’s only 7 pounds and I do feed him a whole 1/4lb puck each day, he goes back to his plate 2 or 3 times to lick it clean. Thank you for producing such a fantastic and healthy product. My husband and I are from Alberta. Since 1995 my husband and I have had Doberman pinchers. They had 2000 sq. feet to run indoors, and a 150’ x 60’ fenced yard to run in outside. They had been fed the best we could afford in ‘kibble’ dog food, plus fresh fruits and vegetables every day, from pups. After about five years, two dogs had developed lumps on their sides and stomachs, pimples on their skin and both had begun to chew at parts of their legs. Our vet, at the time, had suggested we try lamb, chicken and finally a vegetarian kibble from a ‘vet’ approved brand. Nothing helped. Our dogs condition just got worse and much more expensive. There was surgery to remove many lumps (all non-cancerous, thank God) and many biopsies, x-rays, ultra sounds, and blood work. Nothing came up and nothing was helping. Nothing! We had spent thousands on tests, and drugs to figure out the source and our dogs were at their wits end, and so were we. At one point, four veterinarians later, one vet had suggested that we employ an animal psychologist. My husband said “Enough!” and “No!” to any such expense. Finally we learned of a holistic vet in Edmonton that would possibly help. We made an appointment to see her. She suggested we look at a raw food diet and to go to a store called Tail Blazers to check out a quality ‘raw’ food for our dogs. We found your product and everything changed. One of the two Doberman pinchers was overweight, cranky, sweaty, constantly licking her front paws to the point of blood and tissue oozing with pus. After just one month we noticed a huge difference in her attitude and after three months we had a different dog! She went from 96 lbs. to 72 lbs. over the next few months, her coat was shiny again, and she was spunky and happy like a puppy. She is 9 years old, and no one can believe it! Everyone has asked us how we got her to look so amazing and why she is so pleasant to be around now. We told them it is her new food, Pets Go Raw! Morning Sherin, THANK YOU for hooking me up with D’Arcy. She is wealth of knowledge and support. Very impressed with the time she gave me and on top of it all, a really nice lady. First, I want to let you know that my dog, Colt 45 has made a remarkable comeback since he has been on your raw food. Diagnosed with an auto-immune disease at 2 1/2 years old, and slated for euthanasia in January of this year, he has returned to his spunky Rough Collie character. As a result, I am a firm believer in your products. And I let everyone know about your products. I just wanted to let you know that my 6yo mixed breed, Maggie, absolutely loves the raw turkey patties that you make. In the past I’ve tried her on other raw food, and to date your product is easily the best looking (as far as grinding/blending) and tasting (from Maggie’s standpoint, of course!). I will continue to keep Maggie on Pet’s Go Raw food for as long as you continue making it! We made the switch to “Pets Go Raw” a couple of weeks ago and the change is dramatic! My retriever is happier, more mobile and there is a noticeable change in his coat. We bought our food from the Bone and Biscuit in Spruce Grove, Alberta, and the staff were extremely helpful and knowledgeable about your products. Thank you for making my dog’s life happier and healthier! My dog Tim is in a state of euphoria when he is about to get his food from Pet’s Go Raw. This happens every day twice a day. Tim is a finicky customer and he has has other raw foods, but never with this type of reaction. We have been using the Chicken patties for our 2 dogs for a few months. Feeding the other one is never a problem, but Tim used to require daily bribing ( sprinkling with doggie treats etc). I did not enjoy feeding time and neither did Tim. Now he is an enthusiastic participant at meal time. Introducing the newest product to the Pets Go Raw line – Quail Quisine! Quail Quisine – Available in 1/4 lb. and 1/2 lb. wrapped packages! Our Quail Quisine is similar to our Power Diet, with a great variety of veggies (yams, pumpkin, zucchini, romaine lettuce, celery & kelp) and berries (see below), this product is perfect for people looking for a Pets Go Raw product that’s a bit different! Blueberries – Antioxidants, Fibre, & Phytochemicals (to boost immune system & fight the formation of cancer cells), Vitamin A, B1, B2, & C. Manganese, and fights anti-aging characteristics. Cranberries – Fibre, improves cholesterol levels, & fights plaque from forming. Watch for Jason in Alberta next week with his shiny new PGR truck! He is so excited to show it off to you, so make sure you give him a honk or wave!! Driver Jason proudly showing off his new PGR ride! With a great variety of veggies (yams, pumpkin, zucchini, romaine lettuce, celery & kelp), this product is perfect for people looking for a Pets Go Raw product that’s a bit different! Proud to be selected as the ‘Manufacturer of the Year 2016’ in the Kootenays by Kootenay Business Magazine read more at KootenayBiz.com. 2017 Winner in the category of Manufacturing and Product Excellence at The Cranbrook Business Excellence Awards! 1/2lb Variety Pack – A variety of 4 Full Meals in one package! Chicken, Turkey, Salmon and Beef. 1/4lb Variety Pack – A variety of 4 Full Meals in one package! Chicken, Turkey, Salmon and Beef. ‘25lb Bulk Assorted Econo Pack’ – an economically priced, mixed case of any Pets Go Raw products. Can contain any Pets Go Raw protein, and any of the meals offered, or a blend of these (Full Meal, Veggie/fruit, Ground) This is a nice option for pets with no sensitivities and pet guardians want to feed a variety of proteins. These cases are generally 80% – 90% full meals and as such are fine to feed as a “complete diet”. You could add eggs, liver, oil, veggies & fruit if you like. Pets Go Raw Website is Launched! petsgoraw.onetouchsites.com has undergone a full redesign. We hope you enjoy the new look and functionality of our website. Pets Go Raw is proud of a number of high-performing pups. We sponsor Pika and Jennifer stationed in Fernie, B.C. They are members of the Canadian Avalanche Rescue Dog Association and the British Columbia Search Dog Association. They are certified in avalanche, wilderness and tracking search dog profiles. “Pika and I are gearing up for winter and looking forward to being out on the ski hill and in the backcountry soon. Thank you for your continued support,” Jennifer says. Jennifer Coulter. Jennifer is with Fernie Alpine Resort Ski Patrol, an avalanche technician in the South Rockies Field Team for Avalanche Canada and an instructor for British Columbia Search Dog Association. Job: Pika has been busy, and is certified in Emergency Management BC’s wilderness, tracking, ground search, and avalanche search dog profiles. Pika and Jennifer volunteer with Fernie Search and Rescue, the BC Search Dog Association and Avalanche Canada. Food: Pika is an over the top high-energy and high-drive dog that always runs at 110%. Pets Go Raw products provide the calories and nutrition she needs to keep her engine burning as she searches her little heart out! She absolutely loves her raw food, and impresses everyone with her physical condition, power and stamina. Top Hand Supplies Ltd. is proud to sponsor Judith Snowdon and her eventing dogs Castle, Bracket and Drummer. Judith and her husband Darryl have been raising, training and exhibiting some of the top performance German Shepherds in Canada since 1984. They live in southern Alberta and offer boarding and training programs through Shadowbar Shepherds. “Thank you, Top Hand Supplies, for sponsoring the training program at Shadowbar Shepherds. Your continued support has helped us achieve some important titles and High-Scoring Dogs in a variety of dog sports on both sides of the border. Castle, a Shiba Inu bred by Mountain High Shiba Inus, was the Number 1 Rally Obedience Shiba in Canada in 2013, and High-Scoring Dog in AKC Novice Rally obedience with a score of 398/400 in four trials to complete his U.S. RN title! Drummer, a Sheltie, was second with 395/400. Drummer took High in Trial and Reserve High in Trial and Reserve sheepherding in Ontario, and completed his Stockdog Started and Herding Arena Started title. Drummer also was High Scoring Dog in WCR obedience and gained his WCR Level 1 title, with Castle right behind him. Hunter, a GSD, garnered two Reserve High in Trial scores and a High in Trial score to complete his Herding Arena Started Title.